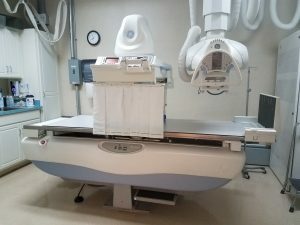 Digital Fluoroscopy – Wayne Radiologists, P.A. Digital fluoroscopy is used to evaluate the anatomy and function of a gastrointestinal, urinary, respiratory, and reproductive organs by using real-time imaging. Upper GI, Barium Swallow, Barium Enema, Small Bowel Series, Chest Fluoroscopy, VCUG, and a Hysterosalpingogram are some of the digital fluoroscopy services offered at Wayne Radiologists. Exam preparation varies depending on what part of the body is being evaluated. Your doctor will provide you will any necessary prep instructions prior to your exam. During the exam you may be asked to stand or lay down on the x-ray table. The fluoroscopy equipment will pass in front of the body part being examined while the doctor watches on a computer monitor. If your doctor ordered a gastrointestinal study, such as an Upper GI or Barium Swallow, you will be asked to drink or swallow Barium, a contrast agent that allows the radiologist to better evaluate the intestinal tract. Conventional x-rays may also be taken in conjunction with fluoroscopy to complete the exam. You must have an order from your doctor to schedule an appointment. In most cases your doctor will schedule the appointment for you and will inform you of the appointment date, time and any necessary prep. If you have questions about your appointment or need to reschedule you can call our office directly at 919-734-1866. The radiologist must review all your images on high resolution monitors before making a final diagnosis. A written copy of the results will be sent to the doctor who ordered your exam within 24-48 hours.